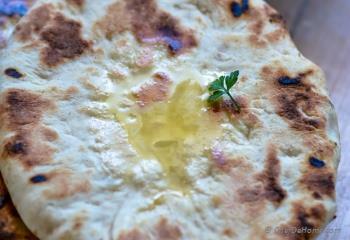 Sharing today, one of my favorite Indian Bread, Garlic Butter Naan which is easy to cook, and don't need yeast or lengthy fermentation time. 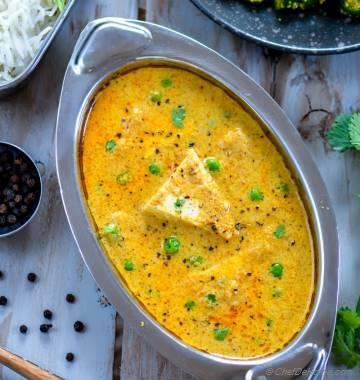 In India, everyone still don't feel comfortable using yeast in everyday cooking. Few weeks ago, when I shared Garlic Naan, everyone back home expected it to be without yeast. Few of my friends even asked me to post a no-yeast method... Saying "post an everyday easy naan recipe, Savita!" Well, if you ask me, I always think yeast naan is very easy to make.... However, I get the point. First, it is really important to know that yeast is fermentation agent which gives naan signature fluffy, airy, and soft texture. Yeast feeds on sugar, multiply in dough making it full of carbon dioxide molecules (bubbles). Longer dough sits, more fermented the dough becomes. 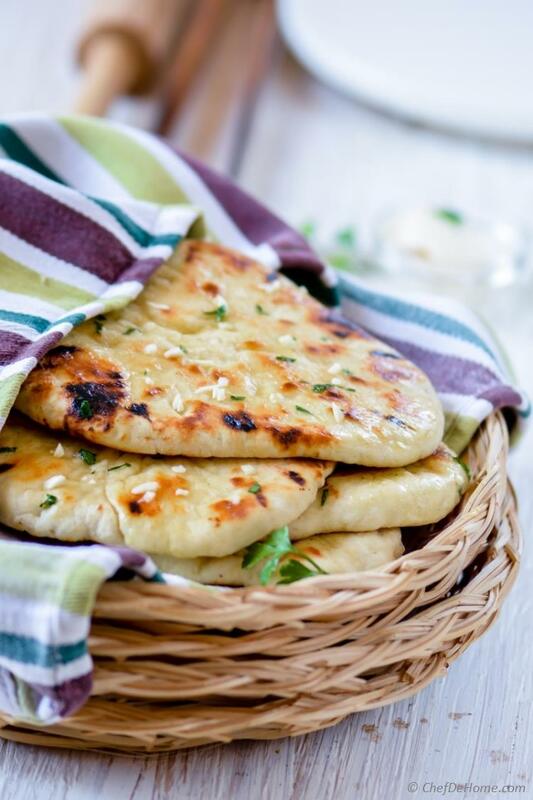 If you can find yeast in your local store and can spare sometime to allow yeast to ferment the dough, you can try my Garlic Naan Recipe which uses yeast. How to get Fluffy Naan without Yeast? Well, good question! Let me share with you, how?! Other than yeast, what leavening agent you can think of which can give airy texture to a bread? These are: baking soda, baking powder, and eggs. So in many naan recipes, all over internet and even in cookbooks, egg and baking powder/soda are added (a lot) to get fluffy (bubbles) texture without yeast. However, a naan bread that is heavy in baking soda or egg can taste very dense, egg-y and will be very heavy on stomach. When I was trying to get a perfect naan recipe without yeast, I did mess up few batches which tasted very egg-y or unappealing due to soda. 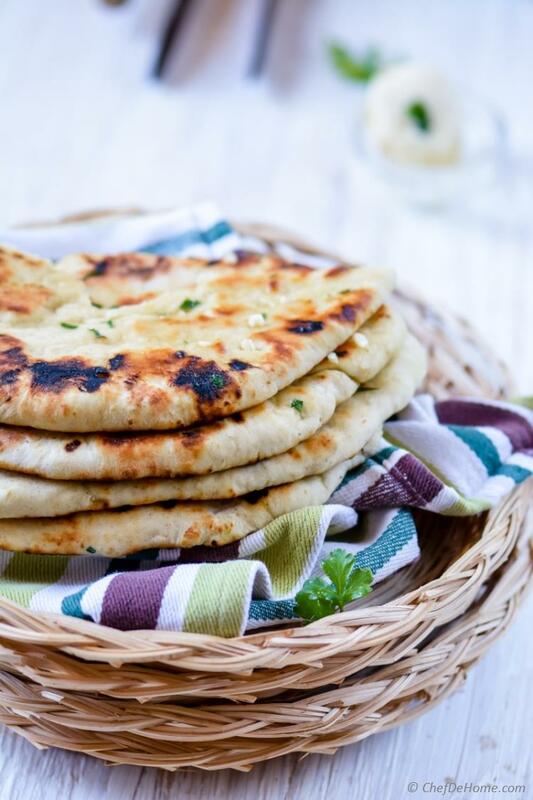 You know, garlic naans or butter naans in general, are special favorite of my better-half. He did not like a single batch which was heavy on egg. But, when I gave him to taste the naan, I'm sharing today, he could not judge if this one is yeast garlic naan or not! hurrah!!! Worth all effort for me!! 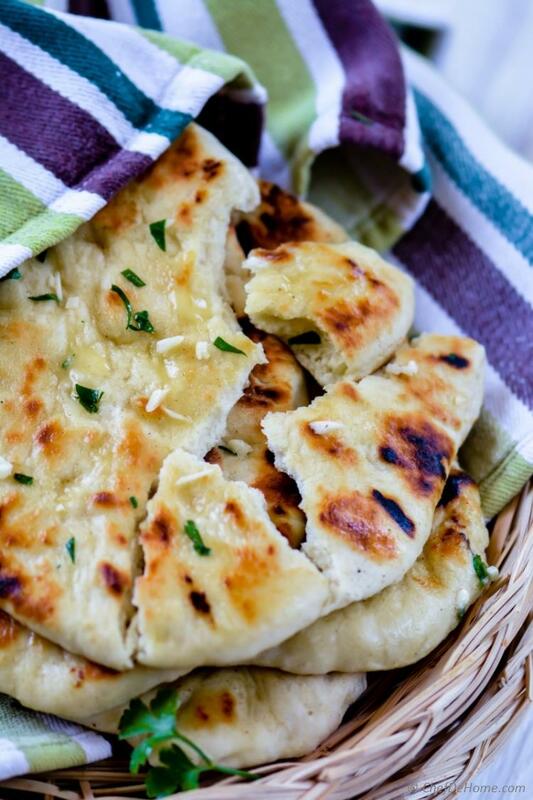 One thing is certain, these naans will sure make you forget store-bought naan. Plus these are healthier than store naans! Chances are, you might start making'em at home very often than picking a packet from store. I promise! You know the best part, these naans can also be baked in household oven. I always tell you, Indian traditional Tandorr is much much high-heat vessel than household oven. So, home oven, due to low heat, (yes, you reading correct), results in not-so-good baked yeast naans. However, addition of egg, in naan dough, keeps them moist and fluffy when baked in home oven. 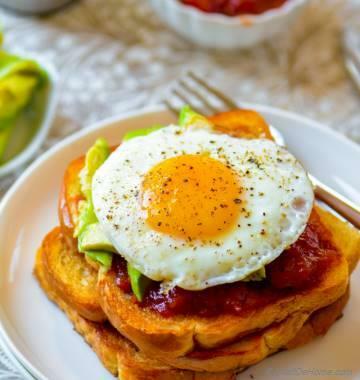 This recipe has become my favorite when I have few guests coming over. Just roll a couple of naans, put on hot sheet pan and bake. Much easier than rolling and searing each naan on tawa (iron skillet), one at a time. Isn't it? So, I have included both instructions, cook on tawa or bake in oven below. Unlike Yeast Naan, I don't recommend freezing Egg Naans. These are best when served just out of the oven. You can cook'em 2-3 hours in advance though. Then, just before serving..... Just like you warm tortillas, wrap naan in damp kitchen towel and microwave for 20-30 seconds. This will freshen-up the texture and make'em moist again. 1) No yeast or much time needed to make these naans. 2) No egg-y smell or Baking Soda after taste. Only egg white and tad of baking soda added, yet lite and fluffy texture matching any store bought naan! 3) Good news!! 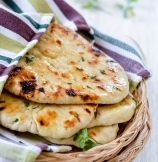 These naans can be baked in oven and will not lose moisture! 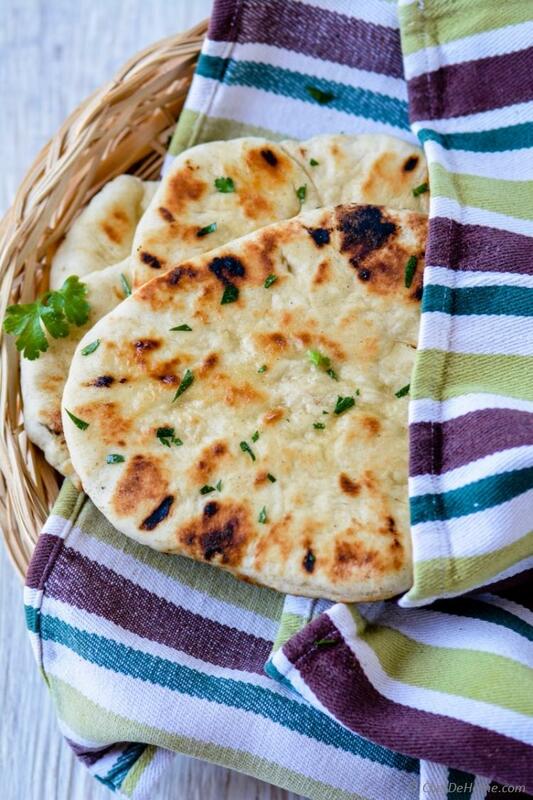 4) Last but not the least, homemade naans gives you option to make it healthier. Use part all purpose and part wheat flour and also skip butter if you prefer. If I may ask, what is your favorite Indian Naan? Yeast or no yeast? Total Time 25 minutes Prep Time 10 minutes Cook Time 15 minutes Difficulty Easy Yields 6 Naans Serves 2 Notes No. of servings depends on serving size! 1. In a wide bowl add all ingredients for Garlic Naan Dough with only egg white and 1/4 cup of milk. Discard egg yolk or use it for breakfast omelette. Not adding egg yolks removes the egg-y smell of naans. 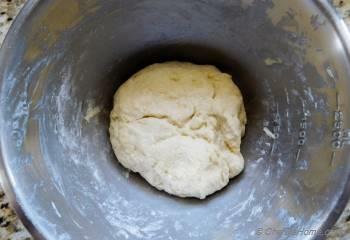 If dough feels too wet or sticky, add 1/2 tbsp flour more at a time. Dough should not be very dry or nor sticky. It should be soft. 3. Coat the bowl with 1 tsp oil, add dough and coat in oil. Cover with clean kitchen towel. Leave on side for at least 30 minutes. 4. Heat an iron skillet or heavy-bottom pan. Or preheat oven at 500 degrees Fahrenheit. Microwave and melt the butter in a microwave safe bowl for 15 secs, add chopped garlic and set aside. Transfer dough to a flour dusted board. Divide dough into 6 equal parts. 5. 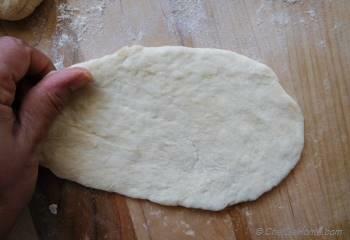 Roll each dough to a (about 3" wide - 6" long) oval shape (or round if you prefer). You can also stretch the dough with hands. While you roll next naan, keep the rolled naans covered with kitchen towel. 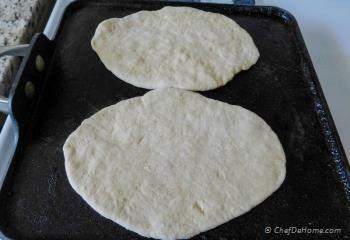 For softer naans, or if planning to cook in oven, leave naan a little thicker than as shown in picture. 6. Tawa Naan (Stove Top) - Place one rolled naan on heated skillet and let it cook for 1-2 minutes or until soda and egg action shows tiny puffed nooks, all over the naan. If using oven, place a sheet pan in oven to start heating up while you roll naans. 7. 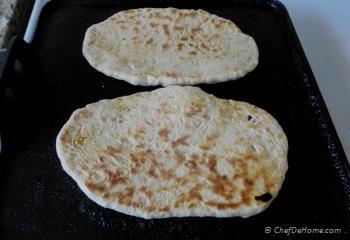 Flip the naan, and cook other side on tawa (skillet) for other 1-2 minutes until brown spots appear all over. Or place it on direct gas flame until slight charred and cooked on other side (just 10-15 secs max). Always keep a tongs/spatula handy to lift or flip the naan. 8. Oven: Place rolled naan on hot sheet tray, two or three, depending on size of sheet tray. Bake for 4 minutes, remove, bush butter, put back in oven with broiler on for 1-2 minute, or until tops are nice and charred. 9. Remove cooked naan with tongs and place next naan on skillet/oven, repeat until all naans are cooked. 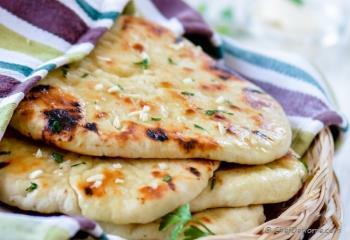 Immediately brush butter-garlic or just butter on cooked naans and spread some chopped cilantro. Butter will keep them moist while you finish cooking the rest. 10. 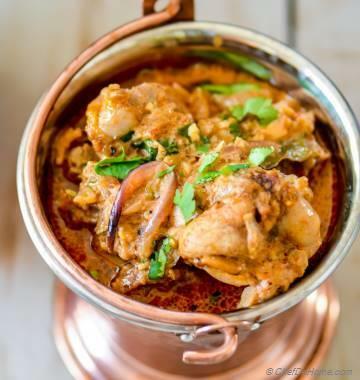 Serve hot garlic naans with you favorite curry and enjoy! Hi Tina. Yes, you can use sour cream instead of yogurt. Start with only 1/4 cup (i.e. 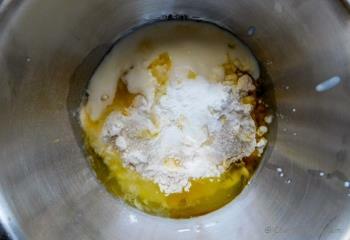 4 tbsp) of milk, then add up-to 4-5 tbsp more milk depending upon how dough comes together. It should not be very dry nor sticky-wet. I hope it helps. The naan was amazing and so soft..thank you for the recipe. thanks for feedback. I’m glad you enjoyed naan. Thanks for feedback, Averil. I'm glad you enjoying Naan. Coconut Yogurt is a good dairy free idea. Loved my garlic naan. Cooked for dinner along with paneer butter masala and rice. My family loved it. This was my first try ever. Thanks for this great recipe. Thanks Usha. I'm happy to share and glad you enjoyed. Could this be made with almond milk? I only ever keep almond milk on hand. Hi Kelsey, Milk is basically used to give softness to dough. I have never used almond milk for this but I think it will be fine. You can also replace regular yogurt with almond milk yogurt (if you prefer). I hope it helps. This was very very tasty!!! And soo easy to make. Very tasty. So easy to make too. I had no yogurt but used sour cream with excellent results. Because sour cream is denser than yogurt I had to add More milk. This recipe was super easy and so delicious. I will definitely be using this recipe again. Shelby, thanks. I'm glad you enjoyed. Thanks for sharing your experience with us. Was home alone today so thought I would try this recipe out (halved the recipe). I only had sweet homemade vanilla yoghurt, so I added some lemon juice to make it sour. The recipe was so quick & easy to follow. Will definitely make again as it was sooooooooo yummy!! What a sweet feedback, Debs! Thanks! I'm glad you enjoyed. Hi Brigitte, 1 cup of flour weighs about 4 ounce, or 115 grams. I hope it helps. Happy cooking! hello. I just moved to an area that is 5500 ft above sea level. ive had to adjust a lot of my baking and bread recipes. does this one need to be adjusted? Hi Kekentia , I don't think this recipe need much adjustment for higher elevation but I have not tested it at high elevation. That being said, since no oven baking is required for this recipe.. naan should turn out fine. 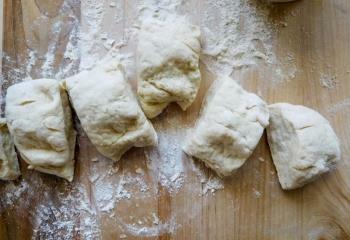 I would keep the dough little moist and roll little thicker naans for soft texture. I hope it helps. HI Lisa, I hope you enjoy! Happy Cooking! Hi Tina, thanks for sweet words. I'm glad your family enjoy these naan so much. I'm happy to share the recipe. Incredibly easy to make! No more store bought Naan for me. Wonderful flavour! Dawn, thanks a lot. 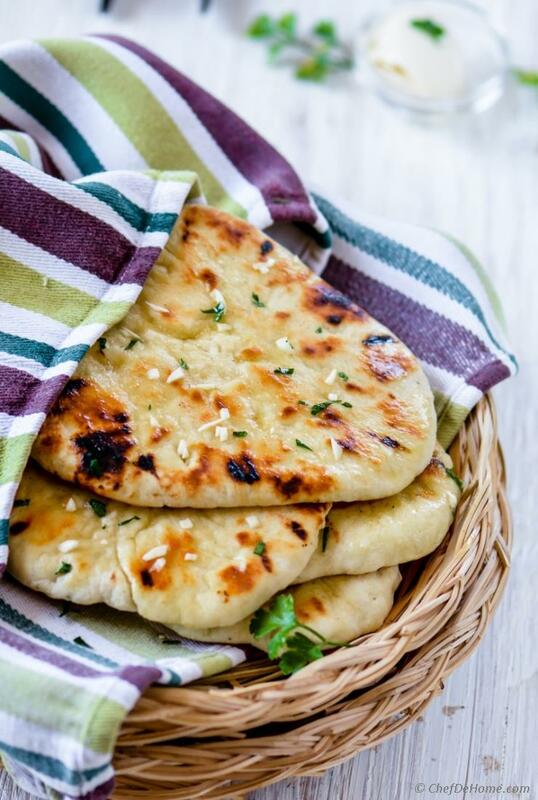 It makes me super happy to hear that you love these homemade naans more than stores bought! Thanks for taking time to share amazing feedback. Excellent. Was perfect my first try. Will never buy store Naan again! Thank-you!!!! Kathy, thanks! 'm glad you enjoyed naan so much. So happy to hear you find your favorite naan recipe here. Thanks for leaving your feedback. Cheers! This recipe worked so well with the gluten-free flour mix. I did have to increase the baking powder to 1 tsp. to make it lighter as the GF flour mix seemed to make it heavier for some reason. I make these all the time now and my gluten-free daughter loves them. thanks, Sarah! I'm glad you enjoyed! this was easy and tasted fantastic, my entire family loved them! can these be made and stored in the fridge for a few days? Hi Amal, I'm glad you enjoyed naans. Honestly, nothing like a fresh made naan but I do freeze these, both cooked or just rolled. Reheat instruction would be same as any frozen Indian flat bread sold in store. I would not refrigerate for more than 1 day as it will start getting dry. I hope it helps.